Just when you think you've seen everything, True Swords has another surprise for you! 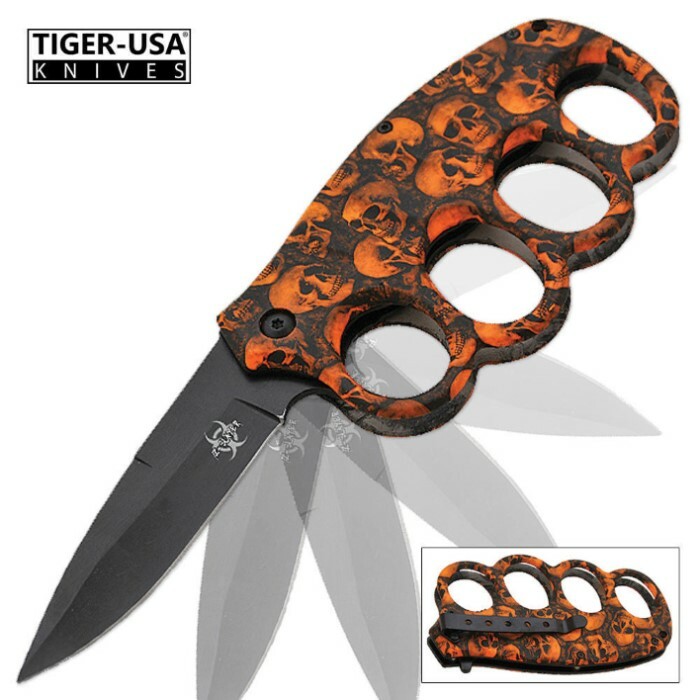 This modern-day trench knife features an anodized aluminum knuckle guard handle design with an orange camo skull mayhem finish on it. The black stainless steel blade is powered by an assisted-opening mechanism that propels the blade into the open position. The pocket clip allows you to clip it to your pocket, pack, gear, etc. This hybrid design combines the fierce applications of the trench knives popularized in WWI with the innovative attributes of modern tactical knives, giving you a knife that's just too good to pass up.